Although the weather, beach, restaurants and shops are all major attractions in Nerja, there are other ways to spend your time, such as pursuing your hobbies and interests in Nerja and the surrounding areas. With an average daytime temperature of around 18°C even during December and January the inviting winter climate makes Nerja an ideal escape from Northern European winter blues from October to April. 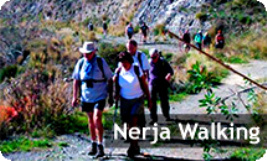 The cooler temperatures also lend themselves well to active holidays for those that enjoy walking, golfing and horse riding, and so we have compiled this page to show you what is available to do while you stay in Nerja and perhaps inspire you to try something a bit different!